Mayor Fernández de la Cámara y Pita, immortalized in history as María Pita, was one of a large number of women who helped to defend Corunna. In the final stages of the siege, when the military forces and the militias were about to be overrun, the women of the town entered the fray and acted as an unexpected strategic reserve force. Many of them were armed with breastplates, helmets and the weapons of their dead or wounded husbands. 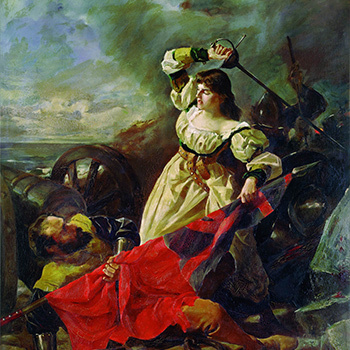 One of these was the well-built María Pita who had recently been widowed and who had the skill to kill the only English ensign who managed to get to the top of the walls and encourage the defenders to drive back the final and most critical wave of attackers, which was about to bring about the town’s downfall. So famous was her action that she was referred to by name and surname in contemporary reports and won great acclaim. She received recompense from the Crown.